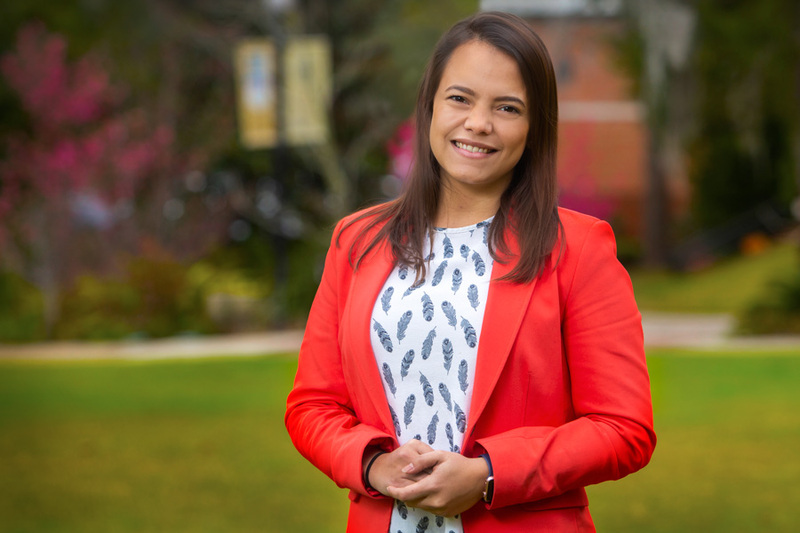 Senior Ariana Morales Rapallo has dealt with some difficult challenges during her college career, but she’s confronted and conquered them on her way to earning a bachelor’s degree in civil engineering at Florida State University. Rapallo grew up in Venezuela where political upheaval created an economic crisis and caused dramatic changes to the education system, which restricted access to universities. “The changes meant I’d not be able to take classes for about six months, so I just decided to leave the country and start all over,” she said. Rapallo decided to enroll at Florida State’s branch campus in the Republic of Panama with the idea that she would move on to the Tallahassee campus under the special 2+2 scholarship program. That program is designed to help citizens of a Latin American or Caribbean country earn an FSU degree. FSU Panama students are able to complete up to two years of undergraduate courses at the Panama campus before moving to Tallahassee to finish their degree at an in-state tuition rate. That option saves a student about $15,000 a year. Rapallo said she was excited to attend Florida State because of the FAMU-FSU College of Engineering. Rapallo has taken advantage of internship opportunities at FSU, and those experiences have helped clarify her vision for a career. In 2018, she worked at Fachhochschule Münster, a partner university in Muenster, Germany, on an undergraduate research project. It was a unique opportunity, allowing her to work alongside professors and doctoral students to study the properties of grout used in underground tunnels. Tunneling grout is used in construction to create a strong bond between a transportation structure, such as a tunnel, and the underlying rock. The grout fills in gaps between a tunnel and the rock bed and creates an impermeable layer that improves a structure’s overall strength and stability. Rapallo conducted lab tests on different mixes of grout and gathered data on their properties, including how easily they could be pumped and how well they would flow. Her research will help highway designers with future transportation planning. She also interned at the Florida Department of Transportation last year. It was a hands-on learning experience, and it proved to be crucial in helping her narrow down career options. As she performed experiments, Rapallo found her niche in concrete engineering. She was fascinated by factors that contribute to the failure of concrete in astral beams in bridges. Civil engineering is kind of like Rapallo’s family business. Her mother is also a civil engineer and has always encouraged her to consider a career in construction. Rapallo remembers growing up and riding with her mom in trucks to construction sites and seeing the engineering process firsthand. Those lessons had a powerful impact. Rapallo eventually found her career passion in structural analysis and concrete design. Rapallo credits FSU with providing the resources and opportunities to help her find the right path going forward. “All of my professors and advisers helped influence me toward the structure side instead of pure construction because I guess they saw my potential,” she said. Rapallo joined the American Society of Civil Engineers-Florida Engineering Society and worked her way up to board member and captain. The organization has allowed her to do what she loves and participate in the rowing and concrete canoe construction competition. In addition, the organization operates the INSPIRE Program, which reaches out to children in lower socioeconomic areas and gives them opportunities to develop skills in science, technology, engineering and math. Rapallo has enjoyed working with students at special STEM-focused events. Rapallo appreciates her FSU professors who have recognized and nurtured her interest and knowledge in civil engineering. They’ve offered her a chance to serve as a teacher’s assistant, and she has taught recitation classes at FSU as a result. Rapallo hopes her FSU education will help her land a job at the Florida Department of Transportation. Eventually, she wants to pursue a doctorate in structural engineering.